Thomas Jefferson’s ca. 1819 Rotunda Planetarium designs called for a mystifying (and dangerous) boom-and-pulley system by which an operator would be lifted to adjust gilt stars fixed to the Rotunda’s concave ceiling. 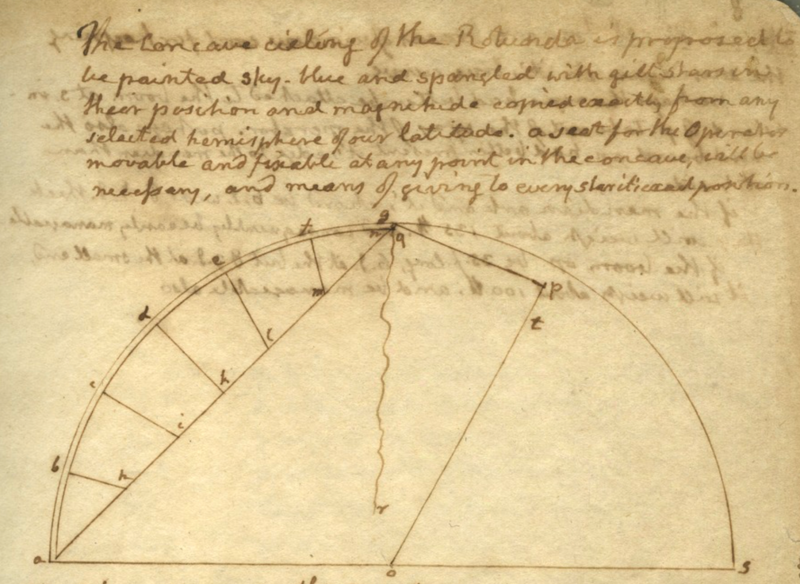 This document, the only description of the Rotunda Planetarium that survives, is bound in a small pamphlet containing Jefferson’s notes and sketches for the University of Virginia [Albert & Shirley Small Special Collections Library, UVa MS 171]. Jefferson was evidently still considering this plan as late as July 1824, when he wrote to John Vaughan, librarian of the American Philosophical Society in Philadelphia, asking if there were “such a thing as a Fresco painter in Phila.? we shall need one to paint the cieling of our Rotunda.” In response, Vaughan informed Jefferson that, “there is no professed Painter of that Branch” in Philadelphia. Here, the documentary trail runs cold. Presumably, faced with ballooning costs and persistent delays in the Rotunda’s construction, Jefferson abandoned the idea and the Rotunda Planetarium was never realized (the Rotunda Library opened two years later, capped by an unadorned dome). Our Rotunda Planetarium trades Jefferson’s fresco painter and boom (‘a white oak sapling of proper strength [! ]’ moved on ‘a compound joint admitting motion in any direction’) for an array of carefully calibrated digital projectors—keeping Rotunda Planetarium visitors safely earthbound! Over the coming months, we will post updates, anecdotes, and discoveries here narrating the development and installation of the Rotunda Planetarium. Stay tuned!